Clear blue skies and comfortable temperatures? Check. Arkansas Blacks available from Ochs' Fruit Farm at the Farmers Market? Check. Fall comic from Incidental Comics? Check. 27/29 parent conferences completed? Check. First formal observation in the books? Check. Science test graded and returned? Check. Ready to welcome 30th student to the class next week? Check. Even more ready to enjoy a four-day Fall Break? Check, check, CHECK! 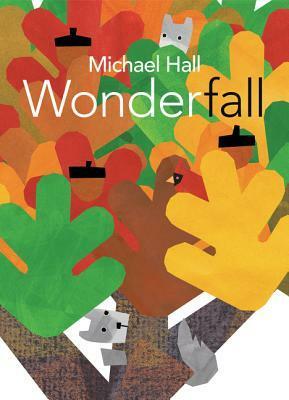 And what better way to welcome Fall and a bit of a break than with a few selections from Michael Hall's WonderFALL. I hope your fall is treating you well (or spring, as the case may be in the Southern Hemisphere)! Join Leigh Ann at A Day in the Life for this week's Poetry Friday Roundup! Our spring has confused itself with summer. We've had record-smashing rainfalls and February Floods come early. Our paddocks are now dressed in vibrant green - or muddy-brown. Congrats on checking so many things off of your list! Happy Friday! What a great way to title the poems-- SomethingFALL. The illustrations look fun, too. Thanks for sharing this one, Mary Lee. This looks like a book that I should get for my "grandgirls." It has been really warm this fall so far here in my neck of the woods. I was sitting outside in my shorts last weekend. Didn't need a jacket when I took Ali for a walk yesterday. Enjoy your fall break! The poems you share from WonderFALL are delightful. I would love to read more! We are ready for fall here in Texas! I can't wait to see the leaves turn and fall. Thanks for sharing this book! Thanks for sharing this book. I haven't seen it yet, but now I'm going to add it to my list. I wish it felt more like fall here. Today it's about 75 degrees, and most of the trees are only beginning to change. I have it from the library, but haven't touched it yet, now it will be at the top, Mary Lee. The wording is so clever. Wow! These titles are so clever! I was running in a tank top and shorts this week--in Maine! Fall is certainly taking its time bringing in colder temps but the colors are here and lovely. Congrats on all your accomplishments this week. You've reminded me to be ever so thankful for lower class sizes. 30! Yikes! You make it all sound under control and well-managed. I am in awe. After that checklist, I would have expected a ramble through a thicket of coats and boots, but instead, a bean-pole muscular song of Autumn. In awe. Thank you for sharing this, Mary Lee. Michael's work is so awesome! I sat next to him at a book festival last weekend and got to chat art with him. Enjoy your long weekend! We have walnut trees, along with the oak trees in our neighborhood, and the squirrels have been busy collecting! Have a great fall break! What a great post. Who knew a checklist could be so poetic and the the images evoked by Michael Hall poems are great fun. What a delightFALL book! Hope you had a restful break! What WONDERfilled poems you shared today, Mary Lee. I especially liked Hall's last poem. I hope you enjoyed your fall weekend. Fun Peace, Plenty and "Beautifall" Fall poems, Mary Lee! I enjoyed following your trip pics too, thanks!